It's been a while since I've done a cookbook review and since we're (mostly) doing Whole30, I thought it was a perfect time to do one! After we did Clean 14 back in September, I went on this hunt to find good Paleo cookbooks. I checked a bunch out from the library and tried out their recipes. One of the first cookbooks that came up when searching for Paleo was Against All Grain by Danielle Walker. At first, I wasn't so sure that I was going to find much to make out of this book. The food seemed a little fancier than I wanted and way too many vegetables. I quickly learned that I liked the fancy food and got over all the vegetables! We made a ton of recipes out of this book! I renewed it multiple times and only returned it to the library because someone else had requested it. I loved it so much, I even put it and a newer version on my Christmas list! This was the first recipe I tried out of this book. What originally drew me was its simplicity but also that it required spiralizing. For some reason, Kitchenaid came out with a new mixer attachment last year that was a spiralizer. I decided I needed one! I wanted to try a spiralizer recipe before spending all the money on the attachment. So I went to Target and got a $15 spiralizer. Never bought the attachment because the cheap one worked so well! Anyway, this was the first of many recipes I made! The marinade for the meat was awesome. I wasn't a huge fan of the noodles, it took a few tries for me to get zucchini noodles to the right consistency when cooking them. It's a great, quick easy recipe though for weeknight meals. This is actually two separate recipes (chutney is separate from the main recipe). I always liked pork tenderloin, but it's really become a staple around our house for weeknight meals. I either buy them in bulk at BJs or stock up when I find them on sale. This is honestly one of my favorite recipes. When we hosted Friendsgiving for my birthday, we made this as the main meat! The pork tenderloin is so tender and is good by itself, really, but the chutney just makes it awesome! The carrots are good and I like that it's a recipe for a whole meal. I always apprecite it when I don't have to use multiple cookbooks at once! Originally, I made this recipe with the Chicken Tenders from Juli Bauer's Paleo cookbook (see post here). 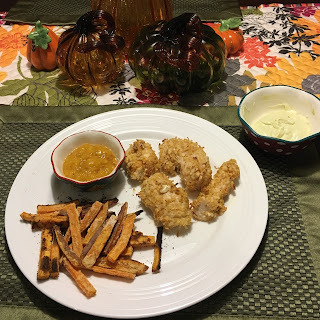 I liked the sweet potatoes and we LOVED the aioli, but doing the two recipes together was a nightmare for me. There was just too much going on in both of them at the same time. I think I also made the sweet potatoes a little too thin and some of them burned. It's definitely worth a repeat though, with a simpler main dish! We also made Spiced Pumpkin Muffins, Seafood Paella, and Pan-Seared Salmon in Red Curry Sauce, I just either a) didn't take photos or b) they weren't very appetizing! Sadly, some crazy person wanted this book from the library and I had to return it, so I made photo copies of all my favorite recipes to hold me over until I could purchase my own copy! I loved this book that much! If you are Paleo, Primal or trying out Whole 30, this is definitely a must read! If you like some healthy recipes, but don't feel the need to be gluten free, check it out from the library because there are still some amazingly good recipes (like the Indian Spiced Pork Tenderloin!). Try it out and tell me what you think! This is reminding me that I definitely need to start cooking more! Your meals look delicious and healthy. I've seen this before and wanted to check it out! And I've also wanted to try making veggie noodles forever but it seems intimidating...is it easy to do? Thanks for sharing this review! I love trying new recipes. These all sounds delicious! Wow! This stuff sounds great! Healthy and tasty is winning!